PROJECT Hurley Alacrity 18ft.Bad points:Keels need replacing due to swelling.Most of interior non-construction panelling stripped out.Minor damage to upper transom.Good:Hull & superstructure sound under old paint including gelcoat.Mast, boom, rudder & deck fittings sound.2 newish winches.Sails (2 sets of 3) & rigging good. Here we have a classic pocket cruiser with a good reputation for performance, stability and stiffness too good to scrap. She has cruised the N.Wales coast for many years but now needs serious attn. to her keels – e.g. metal replacements – as does her owner. Brakeless trailer is sound under flaking paint and is included in sale. 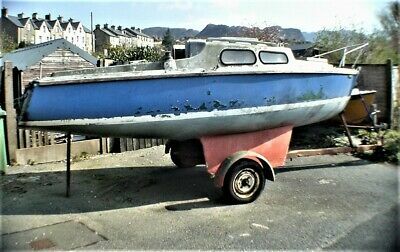 This Project Alacrity Class Sailing Cruiser boat is located in Blaenau Ffestiniog, LL41 3RB and is being sold on eBay by robertg4995.